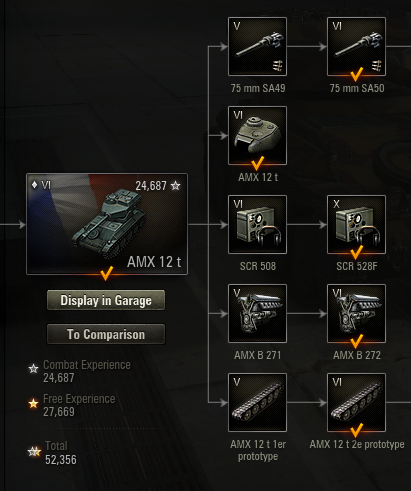 I am struggling so much with the AMX 12t. This tank is ruining the entire game for me right now. (The biggest problem is my personal nature means the worse it gets the more I play it!). 3 wins out of 10 games last night. And it's not just a phase - I just can't get this tank to perform. Can anyone out there supply some general advice on play-style? Scouts do not work in the current meta , what you need is a superheavy. The role of lights has changed dramatically in the last few patches. You need to have very different playing styles depending on what tier you are in your team. Top tier with that tank means you are most likely the best at dishing out damage in your team due to your autoloader. You should be hunting down lights/meds that stray to far from the herd and clipping them then running off and reloading. Mid tier you should stand off slightly and wait for an opportunity to either ambush a damaged tank or assist a brawling heavy with a burst of fire to allow that tank to win his 'individual' duel. Mix in some scouting as well get some assistance damage/exp. Bottom tier, find a bush and scout/spot. Keep relocating and take pot shots at weaker tanks, wait till end game and hunt down the arty/damaged tanks. Watch videos of good players too. well, your 49% on your only superheavy ever played say it all. 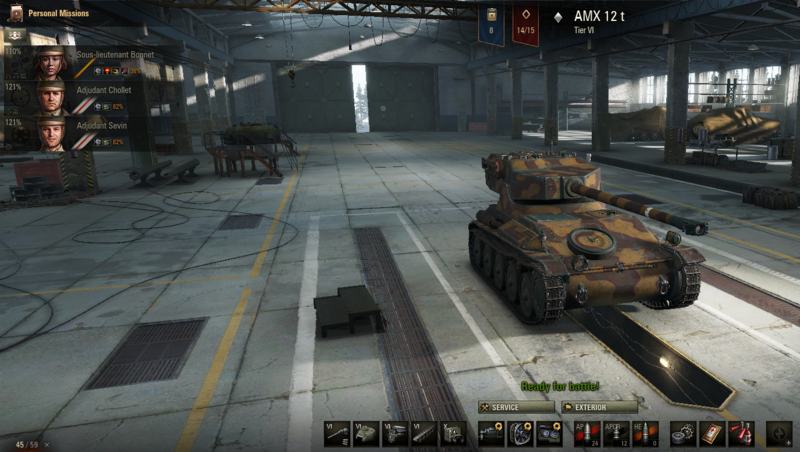 for what I see when I play my tier 6, the lights as the 12t are really devastating during the end of the games when they can unload the clip or hunt other tanks with less tanks that can fire back. But i can be wrong, it's just what i usually see. Edited by Thejagdpanther, 07 September 2017 - 04:18 PM. The best is wait out your chances and dont go fight big heavy tanks , if you see them just drive away and try other spots on the map. Also try to spot early in games to give the team an idea where the enemy is going. What I also like to do is to search and fight lonely tanks that have slow turrets that I can circle and kill. Watch their hp and learn when your chance is higher to kill them instead of get killed. But it also kinda depends on what the mm does , are you top/mid or low tier etc. The one thing I change is what I do in the begin of game , at the end just pick loners and artys. For most of the other tanks I've played so far I reach a point where I 'get it' and can start positively effecting the outcome of games. It says effectively nothing, but you can hardly expect your typical WoT player do interpret numbers correctly. Let alone derive accurate and meaningful conclusions from them. Singling out the 144 games on the E-100, which he could have played years ago merely shows your inability to comprehend statistics in proper context. well, first we need to know the crew skills and equipment layout. if the tank is not fully researched, the above are more important imo. also needed for this tank. and put it on batchat 12t. do you know that you can reload a partial clip? default key is "C" if I remember correctly. as usually you get spotted once you shoot. Edited by Pansenmann, 07 September 2017 - 05:08 PM. I struggled with it too. The problem is, it's pretty slow for a light tank. It has a massive view range. So equip binocs, camo net and try passive scouting. There are some good tutorials out there, i'm sure. Pretty much null and void comment seeing as that E100 hasn't been played in a few years , but then i dont actually care about comments from guys with your stats that troll teir 1 farming newcomers .Kinda makes me lol how your big that makes your EPEEN . Edited by Steel_Patriot, 07 September 2017 - 05:35 PM. T71 has epic matchmaking, top tier half of its games. Same with Luchs. Dont play tier 8 lights because tier 8 mm is fukced up anyway. With a light tank you shouldn't care about mm. if you're somehow magically toptier, you kill, if you're not, you scout. You're right - more info would be useful. So.. I manage to do over my HP in damage on average, but find it difficult to actually 'kill' enemy tanks. A full clip generally can't do it so I have to run away. I realise that clipping tanks isn't really going to happen until later in the game, but usually at that point I'm still facing near full HP tanks with most of my team dead! Everything that hits me - tracks me (< this is infuriating) If I try a quick drive by I get tracked and then I'm dead moments later. Tried a bit of sniping last night - the gun accuracy makes that less than rewarding. If I'm far enough away to not get lit when I fire, I'm too far to reliably hit that tank (let alone weak spots). I always stick at Tier4 until I have 6th sense on my commander. Edited by ThisLittlePiggy, 08 September 2017 - 02:00 PM.